How much do people listen to what you have to say? Do they act on your suggestions? Are folks looking to you for answers? Do your online connections talk about you and engage you regularly? These are some of the factors that determine someone's Klout. If you're not sabotaged, that is; but more on that shortly. For those who don't already know, Klout is a site that measures your online influence. Are you retweeted? Do your friends "like" your Facebook wall posts? Are you mentioned in conversations? Klout looks at these factors, and more, and then assigns you a score that rates your influence. Although the algorithm is still being tweaked, many people (and companies!) are putting a lot of stock into Klout scores. Their hope is that, if you have a high score and an engaged audience, that people will listen to you if you say good things about their products. Simple enough. But, here's where it gets nasty. Some folks, whether it be out of competition or petty jealousy, are trying to impede other people's progress on the site. Intentionally taking actions to stall or diminish other people's scores. Can this really be done? You betcha! If you change the way you normally act, you can have a potential impact on someone's score. Remember, Klout judges how people interact with you. In all reality, your followers and friends hold the key to your success. They can make you or break you. Is this sabotage solely geared to neutralize the competition? Perhaps, so the Mean Girls can get perks and offers their friends don't? What about so they can get bragging rights to the best score in their clique? 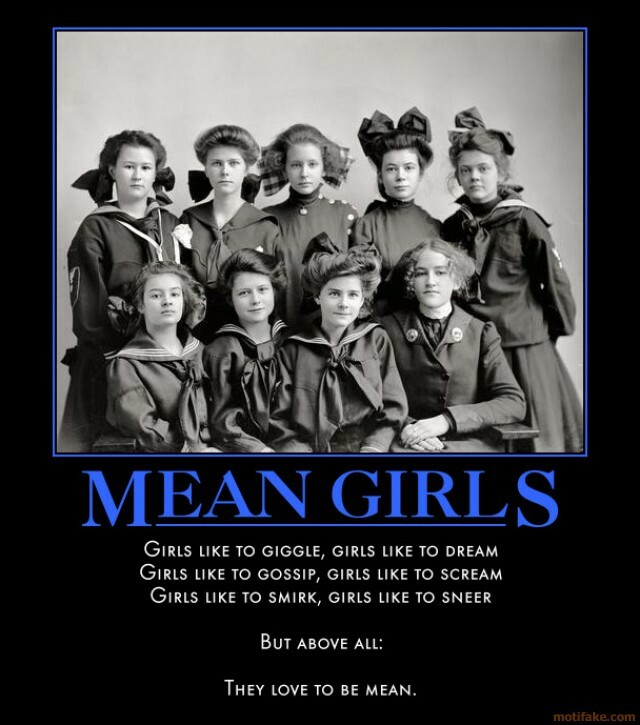 Whatever the reason, the Mean Girl ranks are growing. Sure, lots of people are still cautious about the accuracy of Klout. And, frankly, since it doesn't incorporate blogs into its algorithm yet, I think that's a major handicap. However, businesses such as Fox, Audi, Virgin America, Starbucks, TNT, Disney, and Nike are using the site in their publicity efforts. Identifying online influencers, giving them samples or promotional items, and then hoping for some good buzz. It's a solid strategy as traditional media gives way to the new world of social media. So, my friends, beware the Mean Girls. They may not be 15-year-old girls, in fact they probably aren't. In all likelihood, they're 40 year old men or 28 year old professional women, but they're Mean Girls at heart. People who feel good when you feel bad. Folks whose main goal is to outshine you and humble you in the process. And, as for Klout, it may be in its infancy, but it's laying the groundwork for the future. A time where John Q. Public has just as much influence as Anderson Cooper and Larry King. And maybe more. Annette, being busy is different from being mean. No one thinks a nice person such as yourself is a "mean girl". Not only have I heard and seen the "mean girl" conversations, I can say I'm not surprised by the people who were having them. People like you who have jobs and kids are swamped and we all know that. It would never occur to me in a million years that your social media behavior was suspect. I guess it depends on how vested you are with your time outside of social media. I don't have time to like all the facebook posts, RT everyone that I would like to , etc. With my current job I don't have enough time to keep up with the people that I used to RT. I have been invited to many of the Klout perks you listed (how I wish I could have gone to Toronto for Virgin! or gotten the chance to drive the A8), but I have kids to take care of, so I go for some of the lesser Klout Perks (like TV shows). Maybe I'm not a mean girl, just inattentive. But I also know that Klout doesn't offer the same perks to everyone. Despite the changes coming, my score is about the same as it was 3 months ago. Now to get back to up to 80 LOL! Oh how I HATE those services that sell "followers"...LOL...Sheesh! Thanks for adding to the discussion, Nick. Indeed, support takes a certain level of commitment. However, I see many people who used to lend support to others, but stopped doing so when those people started to get recognition (and gifts) via Klout. I've actually seen it a lot. Petty jealousy and competition have taken the front seat while support and encouragement have gotten tossed out the window. As for who to invest in? Yes, I can answer that. I think it's an easy question. It's always smart to invest in quality people. People who know their stuff and have integrity. People who walk the walk and talk the talk. Quality begets quality. Is it really the Mean Girls that are stealing you of RT's, comments, mentions etc? Or is the real meanie Time , or rather lack of it. I sense it's much more a lack of a attention. It's easier to tweet than to comment. So that's what happens. We tip our hat with an RT or a "nice job", but Twitter constant is so transient. So short term. Real comments on blogs live longer, but take more time & show more commitment. Do people really have time to think about strategies on who to ignore. I know I don't. There's so much candy in the store. It's all so shiny. It's more that we have to pick who to focus our time on. Who are our real URL friends? Who will we still be investing in 3, 6 , 12 months from now. That's not an easy question to answer. Can you answer that? So... what *does* affect one's Klout score? Is this listed in a single place or is it an ambiguous set of algorithms like Google's pagerank? Gotcha, Philip. As I said in the post, "Remember, Klout judges how people interact with you". So I totally get that it's an engagement thing and not a numbers thing. I'm with ya. I knew about Klout but never placed much importance on it until this post....once they include blogs you will get a 100 or whatever the top score is as an influencer : ) Anyway...little did I know that I am an "Expert"...lol...that's the level of my influence...I better get to writing a bit more. I must've missed that one, somehow. I'll stop by later to check it out. Good to see you. Thanks for stopping by! Thanks for chiming in, Ivonne. I was tweeting about Klout last week and had some woman jump down my throat saying I sounded like a spokesperson. When, in fact, all I was doing was saying it's in its infancy and I have no doubt that it's the beginning of looking at "real" people as influencers. I'm sure the folks there are continuing to improve the algorithm and we'll see even more changes down the road. However, technology cannot always compensate for the evil jealousy of frenemies. And, yes, that Shelly Kramer rocks! Hi, Amber. What a great post! One of my favorite activities is people watching and there has been no better place to do that than Twitter this week. No sooner did Joe Fernandez of Klout say on Monday night that changes were coming than the tweets started flying about "my score has dropped", "how can this be", "there must be something wrong with this new algorithm". The changes in the quality of tweets, topic (so and so whose score increased is talking about it) and the attitude shifts have been entertaining to say the least. Those considered experts now have to quantify what they know and how; a veil has been lifted; or in keeping with your title The Mean Girls have been seen without their makeup. Now there is a bigger stadium and a more level playing field. Competition is between the 'experts' and the average person with smarts, hands on knowledge of a subject and communication skills. It's going to be fierce! The battle of good and evil. It never ends, does it? Hey Phillip, thanks so much for chiming in! I appreciate hearing your perspective. Truly. Unfortunately, I'm seeing mean girls flourish on Klout. And, some mean girls who buy followers, to boot! But, yes, whenever I discuss Klout with people, I do emphasize that it's quality and not quantity and I do see that in many people's scores. However, many people will quickly point out that folks with "megaphone" accounts (being people who only broadcast messages, but never engage) have very high Klout scores. I'm very active in the space and I see and hear the Mean Girls out there. It IS real and it's sad (see the examples I gave to Vanessa in her comment below). There will always be a few bad apples in the bunch, but there's a mentality out there that's growing. Especially as more people realize they hold the key to other people's success. Like all things, I know Klout is in perpetual beta. Hopefully, the algorithm will continue to evolve to weed out the troublemakers and acknowledge the true blue rockstars out there. Thanks again for chiming in, Phillip! Wow. And ugh. As the saying goes, wherever you go, there you are. Hey Jessica! Yep, mean girls are everywhere. The 14 year old girls could give a lot of adults a run for their money, couldn't they? Hi, I'm Philip Hotchkiss the Chief Product Officer at Klout. Wow - this post made my eyes open wide while thinking to myself "is this really happening?" Here's one fact I can throw out to clear up a common misconception - follower counts don't matter to us. So please, don't ever hesitate to follow someone because you think it could benefit their Klout score or hurt yours - it can't! Personally, when I engage with people on Twitter and other social media platforms, I do so in a manner that is authentic. If someone with a Klout score of 14 produces great content I'm just as likely to retweet them or converse with them as if they have 80 points worth of Klout. But more importantly, if people want to be successful in gaining online influence - reciprocity is very important. Taking a 1-way approach will work about as well as trying to develop a friendship with someone where you do all the talking and never listen. Create great content - engage in authentic conversations - share great content - compliment people when something good happens in their life - cc people on Twitter with links that you think will be especially relevant to them, etc. In other words, don't be a mean girl or your Klout score will likely plummet over the long run. Vanessa, unfortunately I have many examples of people doing this. People saying "I'm gonna unfollow you because I'm just helping your Klout" or "He doesn't need the RTs, his Klout score is already high" or "Don't answer her tweet, she just wants to hang out with us because we're popular". You can only hope what goes around comes around, eh? you know what? I am just going to use the Mean Girls movie poster pic in my post instead of yours, so no worries! but going to still link to you! love this. spot on! Sure, I'd love it if you link to my post! Thank you! As for the image, I do scour the web for good ones that are unique and compliment my posts. However, if it's out there it's free game. Your call. Thanks for stopping by and leaving a comment, Erin! This is SO true and at the same time, so sad. Ha ha! Thank you, Shelly! You know I'd like to call out the mean girls by name, but those darn journalistic standards get in the way. Oh, yeah, and that slander thing. People are actually doing this? I freely give as I receive and would never think to not like, tweet etc something for fear of diminishing my little piece of influence. Let's hope they get caught and then watch their Klout score sink. I love this post. 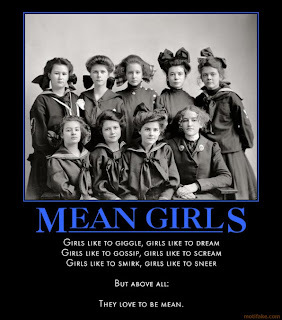 I am working on a post about Mean Girls myself, and am wondering if you mind my linking to you, and if I can use the image you've got here in your post? If it's a problem, I completely understant. Shelly's tweet about you got me over here & I'm so glad! I've already RT'd it! What a great post Amber. LOVE IT!!! And to show those asshats a thing or two, Imma gonna retweet this sucker, share it WILDLY on Facebook and Twitter. So there! Look at @adventuregirl. Stefanie started out on a Twitter as an ordinary person. Today, she has a million and a half followers and is regularly interviewed on television and asked to speak at events. Stef now uses that celebrity to raise awareness about important issues such as malaria prevention and children who suffer from cleft palates. If that's not a prime example of an ordinary person getting a large degree of influence from the social web, I don't know what is. As self-elected President of the Mean Girls Haters Club, i commend you on this post! Too bad we're starting to see this gaming cyber-behavior - just when we were learning to communicate authentically. The Summer of Tweet Love is over? Dude! I love that movie! Did you ever read the book it was based on? I get the rest of what you suggest, but everyone having 15 minutes of fame/influence is not going to trump real power... like anderson cooper and larry king? why did you pick them? Hi Amber! I have been looking for this post for months! I loved it when you published it and couldn't find it again. Loved the correlation between mean girls and social media. Cheers! Citizen journalist or super hero?